Keep any room warm and welcoming with this oil-free radiator from Dimplex. 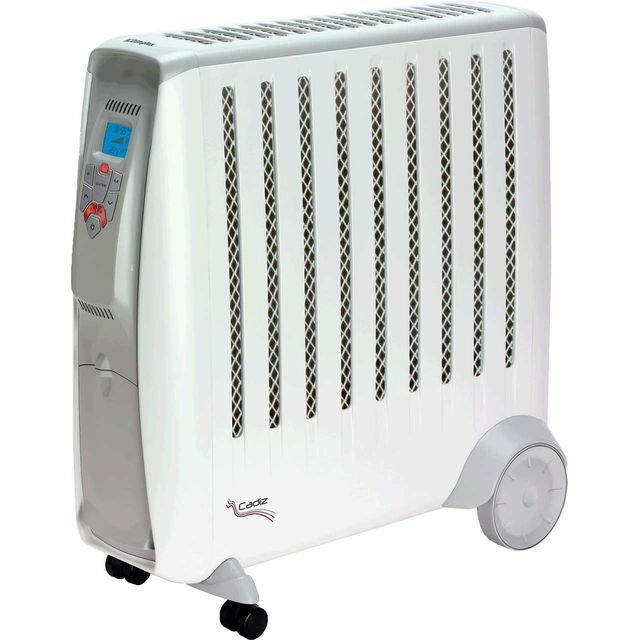 Thanks to its powerful 2000 Watt output it’ll heat up in no time, while a choice of 2 heat settings means you can use it in smaller bedrooms or larger spaces. The useful thermostat automatically keeps a constant temperature so you won’t need to adjust it, and it has a frost protection feature too, which is ideal if you need to use it in the garage. For your added peace of mind, this model will automatically shut off if it gets too hot. The Cadiz eco is an almost perfect oil-free radiator. Fully programmable, It can also be manually operated to heat just a single side (for use against the wall) or to heat both sides up to 35 degrees. It is even remote controlled and has an integral cable compartment to store the power cable out of sight. The single downside seems to be that the power cord length limits the positioning of the radiator; as always in life it is the quality and performance and not the size that it is important though. Heat output is good, dimensions allow for snug placement and storage and the radiator is a quality product from a quality company. would recommend f you want to warm a room up quickly but not if you are going to use it for a long amount of time as its expensive to run.